The other day we received the following email from the editor at Open Book Publishers, a pretty cool project based in the UK, and decided we would share it with you! 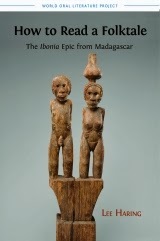 I am delighted to let you know about a new title in our World Oral Literature Series: How to Read a Folktale: The ‘Ibonia’ Epic from Madagascar by Lee Haring, which I thought might be of interest to readers of Recycled Minds. How to Read a Folktale offers an English translation of Ibonia, a spellbinding tale of old Madagascar. Recorded when the Malagasy people were experiencing European contact for the first time, Ibonia proclaims the power of the ancestors against the foreigner. Its fairytale elements link it with European folktales, but the story is nonetheless very much a product of Madagascar. Inflating the form of folktale to epic proportions, it combines African-style praise poetry with Indonesian-style riddles and poems. Through Ibonia, Lee Haring expertly helps readers to understand the very nature of folktales. His definitive translation, originally published in 1994, has now been fully revised to emphasize its poetic qualities, while his new introduction and detailed notes give insight to the fascinating imagination and symbols of the Malagasy. Haring’s research connects this exotic narrative with fundamental questions not only of anthropology but also of literary criticism. Open Book Publishers is a non-profit organization, run by academics in Cambridge and London. We are committed to making high-quality research freely available to readers around the world. We rely on our friends and colleagues to assist in publicizing our books, and we thank you for your support.